Modi is in Anandpur Sahib for Holy occasion, Government put high security arrangements. Punjab Government started trolling on Twitter while thanking #PMModi for giving #BathindaAIIMS. Modi is arriving today afternoon in the Sikh religious town of Anandpur Sahib and will attend a function to mark the 350th birth anniversary celebrations of Guru Gobind Singh, the 10th Sikh master. Anandpur Sahib, which is famous for Takht Keshgarh Sahib, the second holiest of Sikh shrines after Amritsar’s Harmandir Sahib or Golden Temple, is about 85 km. The ‘Khalsa Panth’, the present-day Sikh religion, was founded by Guru Gobind Singh on April 13, 1699. Punjab Chief Minister Parkash Singh Badal along with Daljeet Singh Cheema, thanked Prime Minister over theirs twitter ids. Union Food Processing Minister Harsimrat Kaur Badal too joined the greeting globe. Deputy Chief Minister Sukhbir Singh Badal along with Bikram Singh Majithia thanked PM Modi over Social Media. They would be present during the Prime Minister’s visit. “Tight security arrangements have been made at both places. Around 10,000 security personnel have been deployed to ensure foolproof security at both locations,” a Punjab Police officer told Media4pillar. 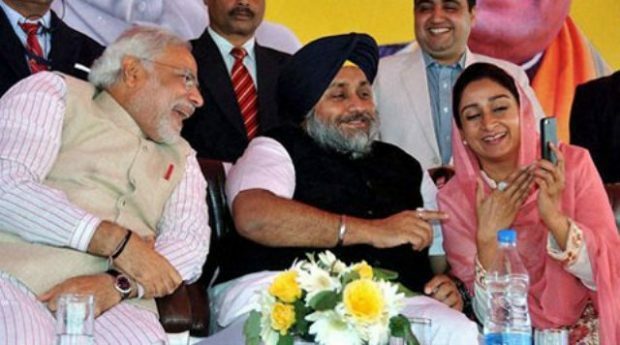 With assembly elections likely to be held in Punjab early next year, Modi’s visit has political and electoral significance for Punjab’s ruling alliance of the Shiromani Akali Dal and the Bharatiya Janata Party (BJP). The alliance has been in power in Punjab since 2007.